André and I stood puzzled at one of or favourite pools in the Jura mountains in Switzerland. The water was clear, the insects were hatching, but neither of us had caught anything. Both of us knew that there must be trout. Yet, they somehow just were not in the mood. This rang a bell. It was at this point that my fishing buddy decided to fish further downstream again and try different nymphs. I believe that anglers often try to cover too much water and do not fish it properly enough. You cannot expect the fishing be best the 5 minutes you are at one spot. The longer you stay, the larger the chance of finding the fish feeding. The only thing what might interrupt them is your approach. This opinion and its impact on my fishing style, gave me the nickname “Paddington”. The first time I was called this was at the Hotel Braurup. Meanwhile, André disappeared downstream around the next bend. Sometimes, I think it is worth covering as much water as possible but only on specific occasions. This is the case if it is a fly fishing exploration trip, where I want to see as much of a river as possible. 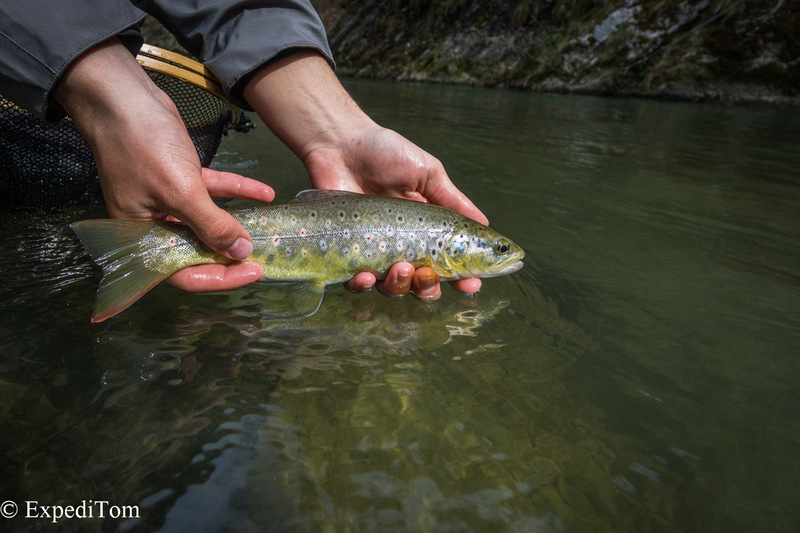 However, if you are fishing a known river, you might consider fishing it more thoroughly and spend more time at one spot than you previously did. Casting the 101st time into the very same bubble line with the very same nymph, I saw the indicator disappear. It was the same boulder the indicator had sunk the previous 100 casts too. So how do you answer this simple question: should I stay or should I go now? Generally, there comes a point where your feeling tells you whether to stay or to go further. The other possibility is, that you have fished a spot so thoroughly that you are assured every fish in this pool saw your fly twice. Yet, this does not exclude them from feeding in a few minutes. I still stood at the same pool, at the very same place. The water was pretty cold given it was early in the season. The indicator drifted along the very same bubble line, when it disappeared again. But this time, it was slightly before the stone. I set the hook pretty hard and the trout went airborne straight away. A short drill later I landed this fish. Looking around for André, I realised that he was too far away. Perhaps, it was not the right time for Paddington Mode. Here are some more images from this fishing trip.